Khalil Rahmanovic, who has a large family made up of 7 people (some distant relatives) recently returned to his village, Potocari in eastern Bosnia and Herzegovina. Potocari is far from the city so finding work has been difficult for Khalil. The Rahmanovic family was presented with a cow from ZF and with the milk and cheese they’ll be able to sell, they’re overjoyed that no family member will ever have to go to sleep on an empty stomach again. Mirza Dubinovic, whose brother was killed while fighting in the Bosnia and Herzegovina Army, received a cow to support his and his brother’s family. Alhumdulillah, the Dubinovic family has been given a chance to make ends meet for the first time. 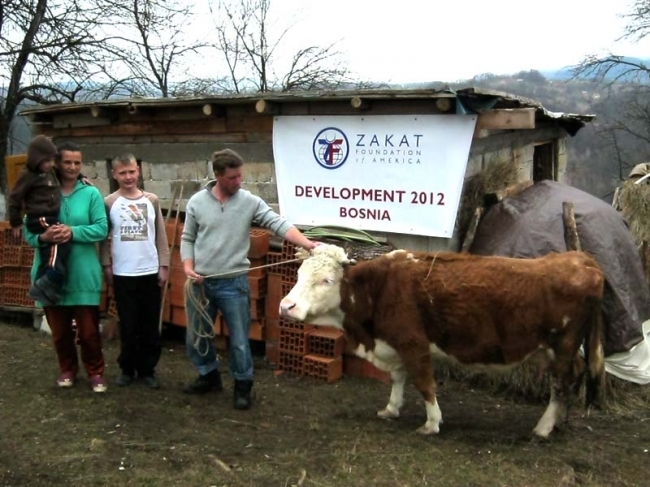 In an effort to rebuild displaced communities in Bosnia, Zakat Foundation of America (ZF) launched its Livestock Development Project. ZF representatives on the ground identified five needy families who were impacted by the conflict and presented the families with cows to help them earn a livelihood. The Livestock Development Project is part of a larger campaign to empower displaced communities in what is now Bosnia and Herzegovina. From 1992 to 1995, the world witnessed one of the worst genocides captured on television in the Bosnian War. As the former Yugoslavia fractured along ethnic lines, groups such as the Bosnian Croats and Bosnian Serbs engaged in conflict that caused the displacement and indiscriminate massacre of hundreds of thousands of Bosnians who were largely Muslim. ZF’s Livestock Development Project is just one of many long-term development projects that encourage needy families to learn a skill or trade to make a living. Other projects include gardening co-ops, sewing programs and livestock sharing programs that provide lasting benefits to needy people around the world. Support long-term development projects like this one in Bosnia and change the lives of families in need today.